Ian Woosnam and caddy Myles Byrne at the British Open. MYLES BYRNE's, (Ian Woosnams' caddy at the 2001 British Open), failure to count the clubs prior to that final round in the British Open at Royal Lytham and St. Anne's, is said to have cost his player Ian Woosnam, 225 thousand pounds, cost Woosnam a potential Ryder Cup spot, and cost Byrne personally, anywhere from 15 to 20 thousand pounds in caddy earnings. And that's nothing to sneeze at for someone who makes his living as a golf caddy! Nothing can possibly be more personally devastating for a professional caddy than what happened to Mr. Byrne there at Royal Lytham and St. Anne's. Pro golf is played in an arena whereby; especially amongst the best players in the world, player and caddy are both striving for perfection. A Perfection where both must be focused in at all the right times. And although it is constantly strived for, it's rarely attainable in the arena of professional golf, where mistakes can and do happen by both player and caddy alike. And when they do, being in the public eye of professional sport, mistakes can come glaring back at you. 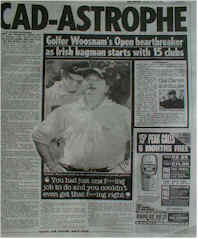 Such was the case in Myles Byrne/Ian Woosnam 15 club debacle at the 2001 -British Open! Byrne has been a professional caddy on the European tour for the past 8 years. Three of his brothers are also caddies out there. He had been working for Ian Woosnam for 8 Weeks, and they had been close to winning two weeks earlier in Ireland. To have cost your player shots under any circumstances is not what pro caddying is supposed to be about. Caddies work hard and by and large pride themselves in an effort to try to ‘save’ their players a stroke or two a round. That's done by providing good information, giving the correct yardage, and correct info about how the shot is ‘actually playing’, helping with club selection, supplying correct info about how to play a particular hole, and overall trying to make the right decision. Each and Every time! So how did such a ‘Seasoned Pro Caddy commit such an odorous offence given the time, place, and circumstance as being tied for the lead going into the final round of a major championship and with a legitimate chance to win! Low and behold as Mr. McMurphy would have it –what went wrong, could, and did in fact, Go Wrong for Mr. Byrne there! The three long known and 'Basic Rules of Caddying' have been summed up in the classic -Show Up, Keep Up, and Shut Up school of caddying! SHOW UP, -(a mental and physical kudo), means to be there on time, which means to be there Ahead of your players warm up time on location ready to go to work. KEEP UP, means –staying Ahead of your player physically, and MENTALLY on the golf course. SHUT UT Applies to the psychological part of the job, -knowing when and what kind of information to offer, when and what to say and when to just SHUT UP! Within these rules of Caddy Preparedness come a subset of tasks that are part and parcel and come with the job. Tasks like preparing the bag for the days play, checking to see the day’s supply of golf balls are there, marking them if necessary, checking other supplies like tees, rain gear, umbrella, food or energy snacks that your player may require to have with him, cleaning and counting the clubs before play begins etc. Most of this should be done by the time you leave the practice warm-up area to go to the putting green before each days round of play, with a final club count-check on the first tee prior to your player hitting his first shot of the day. And on the first tee beginning the days play you must get the hole location pin sheet for the days play along with pencils, extra tees, get your tournament work bib on, and then overall get your head into the game to prepare start with your players opening shot of the day, as well as any last minute stuff he may come up with for you to do! Unfortunately though, we don’t live in a perfect world in life or in golf. There are many distractions that can and will occur. For example, your player may get delayed, he may spend more time at the practice tee than usual, you may get distracted by other people, or conversations, and in the case of Woosnam in this incident, your player may be undecided about a particular club he wants to use that day. (Most commonly players may change putters and drivers from one day to the next.) In this incident, Woosnam had been trying two drivers on the practice range prior to Sundays final round. And I would have to think, he told Byrne, "We'll use this one, not that one, or, "We'll stay with the one we used yesterday," or something like that, when they got finished warming up there. I have to think Byrne got distracted from the driving range to the putting green, as he didn't discard the second driver, and arrived at the putting green with Woosie, 15 clubs in hand. Peter Coleman who caddies for Bernard Langer was one of the 6 players tied for the lead prior to teeing off in Sunday’s final round. He arrived at the putting green prior to Sundays final round with Langer after warming up on the practice range, and saw that Woosnam was still there putting. "What time are you out?" Coleman asked Woosnam. "2:25" replied Woosnam. "No", said Coleman, "That’s our time." Thereafter Woosnam picked up his ball and along with his caddy Byrne, hurried off to the 1st tee. So now we have two mitigating and contributing events leading up to the ‘Big Mistake’ that was about to occur. Player tries out new driver and has two of them in the bag instead of one upon leaving the practice warm up area. The Caddy, (Byrne), is not on his Caddy P’s and Q’s with regard to knowing the correct tee time, both he and his player think he’s ten minutes later teeing off than he actually is for the round. So upon arriving at the putting green. this Caddy now has made two mistakes, the BIG ONE being that he should have kept the trial driver out of the bag. Instead off they go off in their haste to get to the 1st tee, the extra driver still in the bag! Now for mitigating circumstance # 3. They are teeing off on the 1st tee at Royal Lytham and St. Anne’s which happens to be a par 3. This is unusual, as most golf courses will start you off with a par 4 or 5 which would have greatly increased the likelihood that they would have had to hit a driver, and then would have looked in the bag and realized that there were still two drivers in there! Instead Byrne is now getting the yardage and discussing club selection on the par 3 opening hole! So as you see how Byrne might have erred! And given the amount of distractions going on and around a major championship with possibly the biggest title in golf up at stake –the British Open! Which brings us to the end of this Sad Caddy Tale! (And It is unfortunate that the biggest caddy story of the year thus far has to be a negative one.) On the Monday following the Byrne 15th Club Caddy Debacle every newspaper in the British Isles including the London Times had full Front-Page stories about what had happened! 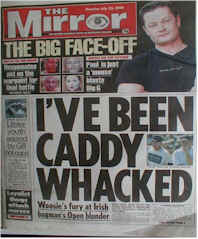 There was almost more coverage on this Caddy Debacle than on David Duvals win and first major championship victory! And I don’t mean headlines of the Sports Pages either, but the Front Pages of all of them! Yes Myles Byrne failed to show for his tee time in Sunday’s final round after a night on the town at a tournament two weeks later on the European Tour, and now Woosie could justifiably give him The Sack! This capped off the Myles Byrne Story and it all made the papers again, "Woosie sacks caddie who can't count or tell time!" Woosnam would have looked a lesser fellow had he fired the guy in the public eye right after 'The Well Publicized Mistake on Sunday of the British Open, but overall Byrne had been a good caddy, and had done a good job, 'til' now! But the bad press had traveled far and wide and it was only another mistake to finally ‘put the knife in him’. It was a mistake of his own doing again; One, Two, 'Three Basic Caddy Rule' Violations, and you’re out! -"Hey Boss, which driver are we going to use today, ya know we’ve got 15 in the bag right now!"